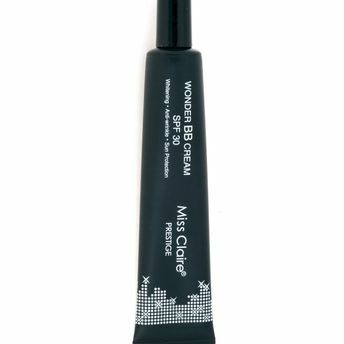 An amazing combination of skincare and makeup, Wonder BB Cream SPF 30 by Miss Claire is a multi-purpose makeup product that offers great skin whitening, anti-wrinkle and ultimate protection from harmful UV rays. Enriched with correcting pigments, this hydrating BB Cream provides excellent concealing to blemishes and brightens skin tone. The formulation contains Arbutin and Adenocin, performing new in whitening, illuminating and anti-wrinkle, giving skin a flawless, silky look. Explore the entire range of BB & CC Cream available on Nykaa. Shop more Miss Claire products here.You can browse through the complete world of Miss Claire BB & CC Cream .Alternatively, you can also find many more products from the Miss Claire Prestige Wonder BB Cream range.